All prices are in Thai Baht. If you want to find out how much it is in your own currency, please click here. 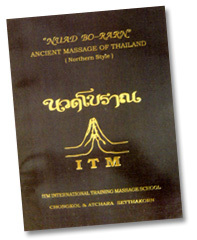 This 193-page book introduces the ancient art of Northern style Thai massage with its complete 4 positions; Front, Side, Back, and Sitting positions. This step-by-step instruction includes pictures and illustrations which detailing pressure points, lines and directions making this book an essential addition to both beginners and experts. Filmed in a marvellous location of a traditional Thai spa, this DVD has an original and relaxing atmosphere for learning. Demonstrations includes four sections of the Front, Side, Back, and Sitting positions are clearly demonstrated to give the practitioner a better understanding of movements, positions, and techniques. 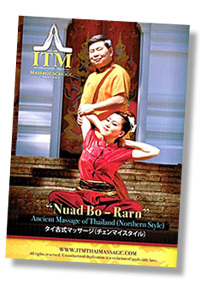 This new edition of Thai massage DVD is a perfect learning partner complementary to the book ‘’Nuad Bo-Rarn’’ Ancient Massage of Thailand by Chongkol and Atchara Setthakorn. It is strongly recommended to use this DVD with the book. Chongkol Setthakorn created this original Thai Yoga exercise in 1990. It is designed to prepare the practitioner’ s body to better understand Thai massage movements and the practitioner’ s mind to calm and focus on Thai massage. This Yoga exercise is practiced at ITM-Thailand every morning before lessons.